Vitamin D has been reported to be associated with many allergic diseases. There are a limited number of the studies of vitamin D supplementation in patients with chronic spontaneous urticaria (CSU). This study aims to study the relationship between vitamin D and CSU in terms of serum vitamin D levels, and the outcomes of vitamin D supplementation. A literature search of electronic databases for all relevant articles published between 1966 and 2018 was performed. The systematic literature review was done following Preferred Reporting Items for Systematic Reviews and Meta-analysis recommendations. Seventeen eligible studies were included. Fourteen (1321 CSU cases and 6100 controls) were concerned with serum vitamin D levels in CSU patients. Twelve studies showed statistically significant lower serum vitamin D levels in CSU patients than the controls. Vitamin D deficiency was reported more commonly for CSU patients (34.3–89.7%) than controls (0.0–68.9%) in 6 studies. Seven studies concerned with vitamin D supplementation in CSU patients showed disease improvement after high-dosages of vitamin D supplementation. CSU patients had significantly lower serum vitamin D levels than the controls in most studies. However, the results did not prove causation, and the mechanisms were not clearly explained. Despite the scarcity of available studies, this systematic review showed that a high dosage of vitamin D supplementation for 4–12 weeks might help to decrease the disease activity in some CSU patients. Well-designed randomized placebo-controlled studies are needed to determine the cut-off levels of vitamin D for supplementation and treatment outcomes. Chronic spontaneous urticaria (CSU) is defined as the occurrence of spontaneous wheals, angioedema, or both for more than 6 weeks . Recommended first-line treatment is modern, second-generation H1-antihistamines. For refractory patients, a short course of systemic corticosteroids, omalizumab or ciclosporin is recommended . Vitamin D, a fat-soluble vitamin, exists in two forms: D2 (ergocalciferol) and D3 (cholecalciferol) . The human body gains it from the diet and sunlight. Vitamin D2 has been found in some mushrooms, e.g., shiitake mushrooms and button mushrooms. Vitamin D3 is commonly found in halibut, mackerel, eel, salmon, beef liver, and egg yolks . Within the human body, only the skin can produce vitamin D3. Ultraviolet B radiation (wavelength, 290–315 nm) converts 7-dehydrocholesterol in the skin to previtamin D3, which is rapidly converted to vitamin D3. Vitamins D2 and D3 from diets and vitamin D3 from skin photobiosynthesis are initially metabolized by the liver enzyme 25-hydroxylase (CYP2R1) to 25-hydroxyvitamin D (25(OH)D), the major circulating metabolite which is commonly used for evaluation of vitamin D status. The 25(OH)D is metabolized in the kidneys by the enzyme 25-hydroxyvitamin D-1α-hydroxylase (CYP27B1) to 1,25-dihydroxyvitamin D (1,25(OH)2D), the most biologically active form of vitamin D .
Vitamin D plays a major role in mineral homeostasis . Besides its role in bone physiology, it also has a role on cutaneous immunity by binding to its nuclear receptors and plasma membrane receptors of epithelial cells, and to various cells such as mast cells, monocytes, macrophages, T-cells, B-cells, and dendritic cells [4, 5]. In the innate immune system, vitamin D contributes to improving antimicrobial defenses by stimulating the expression of antimicrobial peptides such as cathelicidin and human β-defensin . In the adaptive immune system, in vitro study showed that physiologic (in vivo) concentration of 25(OH)D3 in serum-free medium can activate T cells to express CYP27B1 and then convert 25(OH)D3 to 1,25(OH)2D3. (active form of vitamin D) . Vitamin D can suppress dendritic cell maturation and inhibits Th1 cell proliferation by decreasing Th1 cytokine secretion. It also induces hyporesponsiveness by blocking proinflammatory Th17 cytokine secretion and decreasing interleukin (IL)-2 production from regulatory T (Treg) cells. It inhibits B-lymphocyte function resulting in the reduction of immunoglobulin E production [8, 9]. Moreover, vitamin D has influences on the proliferation, survival, differentiation, and function of mast cells [5, 10]. The vitamin D binding protein (VDBP) and vitamin D receptor (VDR) are two proteins that influence the biological actions. VDBP is the main carrier protein in the circulation. Group-specific component (GC) is the gene that encodes VDBP . Genetic polymorphism in the GC gene influences the concentration of VDBP and its affinity for vitamin D. Regarding VDR, the binding of VDR to vitamin D results in epigenetic modification and transcription of various specific genes . The human VDR gene is located in chromosome 12. Polymorphism in the VDR gene has been shown to alter VDR functions that affect vitamin D activities . Among the VDR polymorphisms, the SNPs rs1544410 and rs2228570 are frequently studied in association with allergic diseases. However, Nasiri–Kalmarzi et al. reported no significant correlation between the VDR rs2228570 and VDBP rs7041 SNPs and the development of chronic urticaria (CU), although they found a positive correlation between serum VDBP and the progression of CU. They concluded that alteration of the vitamin D pathway at the gene and protein levels may be a risk factor for the progression of CU . There have been reports of an association between vitamin D and allergic diseases, such as food allergies, rhinosinusitis, recurrent wheeze, asthma, atopic dermatitis, and CSU [15–17]. Some studies have shown that vitamin D is involved in the etiopathogenesis of CSU, while other studies have demonstrated clinical improvement in CSU with vitamin D supplements. However, there are a limited number of studies on this issue, and their results are inconsistent. [14, 18–33]. 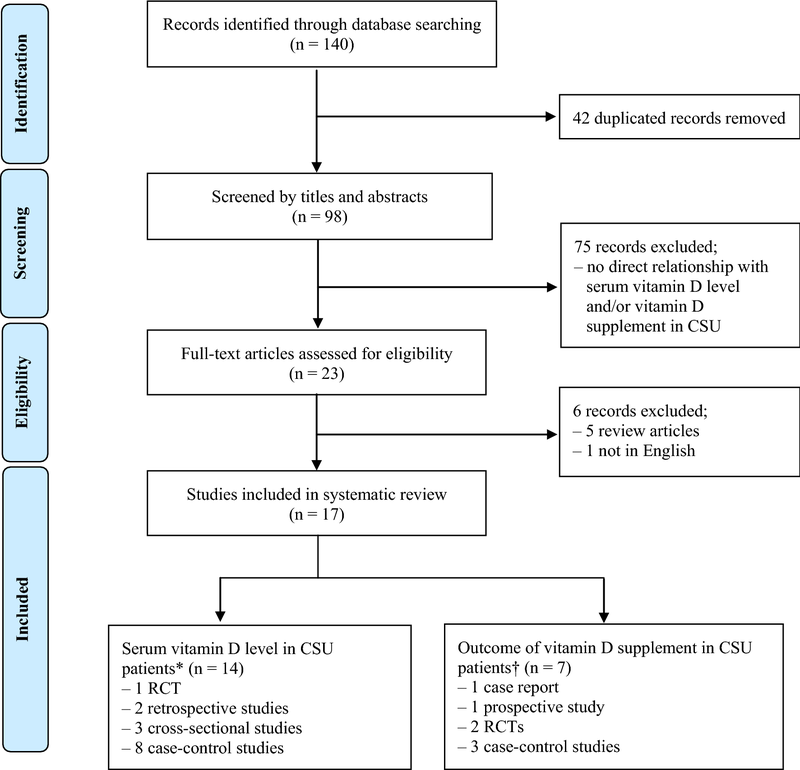 We performed a systematic review to examine the serum vitamin D levels in patients with CSU. Data concerning vitamin D supplementation in the CSU patients were also studied to determine whether supplementation impacts treatment outcomes. This systematic review adhered to Preferred Reporting Items for Systematic Reviews and Meta-analysis recommendations (PRISMA). A literature search of electronic databases (PubMed, Scopus, Web of Science, MEDLINE, The Cochrane Library, and CINAHL) for all relevant articles published between Jan 1, 1966, and September 30, 2018 was conducted using the search term “chronic urticaria and vitamin D or 25(OH)D insufficiency or deficiency or 1,25 (OH)2 vitamin D insufficiency or deficiency” The titles and abstracts of the articles identified in the search were screened by two independent reviewers (KK and SA) for eligibility based on the inclusion criterion. Full texts were then obtained and assessed for eligibility by those two reviewers (KK and SA). A further manual search of the references cited in the selected articles was subsequently performed to identify any relevant studies that might have been missed in the initial search. Finally, all yielded relevant reports were systematically reviewed (Fig. 1). Any types of publication involving vitamin D in CSU patients were included in our systemic review. The exclusion criteria were: (1) articles that were not published in English; (2) duplicated publications; (3) studies published only in abstract form; and (4) continuous medical education (CME) and review articles. Two investigators (KK and SA) assessed the risk of bias of the eligible studies included in this systematic review. We used Cochrane Collaboration’s tool to assess the risk of bias in randomized controlled trials (RCTs). The Risk Of Bias In Non-randomized Studies-of Interventions (ROBINS-I) tool was used to assess the risk of bias in non-RCT studies. The search strategies were mainly used to identify vitamin D levels, and to compare the levels found in CSU patients and controls. Serum vitamin D levels are mostly reported in the form 25(OH)D. After the eligible full-text articles were reviewed and the relevant data reported in those articles were further searched, the following information was extracted from each: the first author, year of publication, type of study, number and characteristics of the population, number of cases and controls, method of vitamin D measurement, type (form) and unit of the measured serum vitamin D, vitamin D levels in case and control groups, and study outcomes. Information was completely and carefully extracted from the eligible articles. We also examined whether vitamin D supplementation has an impact on the outcomes of urticaria treatment. All relevant data were extracted, namely, the first author, year of publication, type of study, number and characteristics of cases and/or controls, form, dosage and duration of vitamin D treatment, assessment duration, methods and parameters for outcome measurement, vitamin D status at baseline and after vitamin D treatment, and treatment outcomes. The detailed steps of the literature search are illustrated in the flow chart at Fig. 1. A total of 140 potentially relevant studies were found. The titles and abstracts of these articles were reviewed. Of the 117 excluded studies, 42 were removed due to duplication and 75 were irrelevant; the remainder (23 studies) were screened for full text review. According to the inclusion and exclusion criteria, 5 review articles were excluded, and 1 study was excluded because it had not been published in English. The full texts of the remaining 17 studies were extensively reviewed, and all were finally included [14, 18–33]. The 17 studies were published during the period 2010–2018 [14, 18–33]. The main characteristics of the studies were summarized into two issues: serum vitamin D levels in CSU patients, and outcomes of vitamin D supplementation in CSU patients. Three RCTs in our systematic review were estimated mainly at low risk. The majority of the non-RCT studies had a low risk of bias according to ROBIN-I assessment. Fourteen studies were concerned with serum vitamin D levels in CSU patients. There were 1 RCT , 3 cross-sectional studies [20, 22, 33], 8 case–control studies [14, 18, 21, 23–25, 28, 31], and 2 retrospective reviews [29, 30] (Table 1). All studies drew upon data from a total of 7421 participants, with 1321 patients with CSU and 6100 controls, including 5456 healthy controls, and 25 cases of allergic rhinitis controls. The remaining 619 participants were 593 acute urticaria patients and 26 atopic dermatitis patients. Statistical analyses for meta-analysis were not performed due to the substantial heterogeneity of the reported data. The methods used for the measurement of vitamin D varied among the studies (Table 1). All of the studies reported the serum vitamin D level as 25(OH)D except two: one study by Woo et al. , which measured 25(OH)D3, and Nasiri–Kalmarzi’s study, which did not report the type of vitamin D measured . The units of serum 25(OH)D were reported mainly in ng/mL [14, 20–23, 25, 28, 29, 31, 33], but some studies reported them in µg/L  and nmol/L [18, 30, 32]. The main outcomes of the serum vitamin D levels in the CSU patients compared to the controls are summarized at Table 2. Twelve studies showed statistically significantly lower levels of serum vitamin D in the CSU patients than the controls [14, 18, 20, 21, 23–25, 28, 29, 31, 33]. Wu et al. showed significantly higher levels of serum vitamin D in the CSU patients . They compared the serum vitamin D levels of CSU patients in Southampton General Hospital to those of the general United Kingdom (UK) population (data from the National Diet and Nutrition Survey). The serum vitamin D levels of the 225 CSU patients were significantly higher than those of the 1321 UK population (control group). Lee et al. conducted a cross-sectional, population-based study of Korean children (aged 4–13 years; 3159 were controls; 624 had current urticaria, of which 57 were CSU and 567 acute urticaria). There was no statistically significant difference in the serum vitamin D levels of the CSU patients and the controls (p = 0.124) . One study reported negative association. Three study reported significant lower levels of vitamin D in patients with a positive ASST. The serum vitamin D levels were categorized into subgroups according to the vitamin D status. Serum 25(OH)D levels of > 30 ng/mL, 20–30 ng/mL, and < 20 ng/mL were defined as sufficiency, insufficiency, and deficiency, respectively; levels of < 10 ng/mL indicated a critically low or severe deficiency. The cut-point values to define vitamin D status in each study were very similar even though slightly different values were found in some studies (Table 3). The prevalence of vitamin D deficiency was reported more commonly in the CSU patients (34.3–89.7%) than in the controls (0.0–68.9%) in 8 studies [21, 23, 24, 28, 29, 31–33]. Four of those studies reported statistically significant differences [21, 24, 29, 31]. The effects of vitamin D on CSU are summarized at Table 2. The studies also compared the serum vitamin D levels of the CSU patients with those of patients with other diseases, such as acute urticaria [22, 29], atopic dermatitis , and allergic rhinitis . Vitamin D level was significantly lower in CSU patients than in atopic dermatitis and allergic rhinitis [28, 29]. Four out of 11 studies reported significant association between low serum vitamin D levels and high disease activity whereas seven studies did not find this significant association. Most studies demonstrated that there was no association between low serum vitamin D levels and disease duration [18, 21, 28, 32, 33]. Others reported a relationship between the serum vitamin D levels and other investigations, including erythrocyte sedimentation rate [20, 31], C-reactive protein , serum IgE [14, 18, 23, 24, 32], IL-17 , transforming growth factor-β1 , thyroid autoantibodies [24, 28], autologous serum skin test [14, 21, 28, 29, 33], and autologous plasma skin test . It was shown that low serum vitamin D level was significantly associated with high levels of ESR, IgE, IL-17, and transforming growth factor-β1 [18, 20, 31]. Seven studies (2 RCTs [26, 32], 3 case–control studies [24, 25, 31], 1 prospective study , and 1 case report ) were concerned with vitamin D supplementation in 587 CSU patients. The outcomes of the vitamin D supplementation were compared to baseline in 6 studies [19, 24–27, 32] and to controls in 1 study . The regimens of vitamin D supplementation in each study were reviewed and are summarized at Table 4. Four studies used vitamin D3 at dosages ranging from 2800 to 75,000 IU/week [24–27], one study used vitamin D2 at a dosage of 140,000 IU/week , and another study did not define the form of vitamin D administered at a dosage of 50,000 IU/week . Similarly, the form of vitamin D supplementation was also not defined in the RCT study but patients were categorized into three groups to receive low-dose (2000 IU/d), high-dose (60,000 IU/week), and without vitamin D supplementation, respectively . The duration of the vitamin D supplementations ranged from 4 to 12 weeks. The serum vitamin D levels were evaluated in 4 studies and were reported as 25(OH)D [25–27, 31]. Subjects in the high vitamin D3 treatment group reported decrease body distribution of hives on an average day (p = 0.033), decrease body distribution of hives on the worst day (p = 0.0085), and decrease number of days with hives (p = 0.03) compared with subjects in the low vitamin D3 treatment group. None of the patients in the vitamin D supplement group were symptom-free at the optimal vitamin D levels. Vitamin D replacement decreased the severity in most patients. The parameters of treatment outcomes varied among the studies; they comprised the urticaria activity score over 4 days (UAS4) [24, 32], urticaria activity score over 7 days (UAS7) , dermatology life quality index [19, 31], chronic urticaria quality of life questionnaire , visual analogue scale , 5-dimension itch score , and urticaria symptom severity score [19, 26] (Table 5). Four studies reported a significant reduction in disease activity after high dose vitamin D supplementation (vitamin D2, 140,000 IU/week; vitamin D3, 60,000–75,000 IU/week; and unknown form of vitamin D, 50,000 unit/week) [19, 24, 25, 31]. One case report showed that treatment with a low vitamin D dosage (400 IU/d) for 2 months did not reduce urticaria activity. However, complete resolution without antihistamine was demonstrated at a higher dosage (2000 IU/d) . Another study reported a significant reduction in disease activity after high-dose vitamin D supplementation (4000 IU/d) compared to low-dose vitamin D supplementation (600 IU/d) . Ariaee et al. reported that the transforming growth factor-β, IL-10 and IL-17 expressions were decreased after 8 weeks of vitamin D supplementation . In addition, forkhead box P3 (FOXP3) expression, a clinical determinant of Treg, increased after treatment . In the RCT study, either low-dose or high-dose of vitamin D supplementation could reduce disease severity but there was no significant difference in the mean UAS4 among the three groups after 12 weeks of supplementation . Two recent meta-analysis regarding the association between vitamin D and urticaria have been published in 2018. Tsai et al. and Wang et al. showed that the prevalence of vitamin D was significantly higher in CU patients than that of controls. [34, 35] Similar to those two meta-analysis, 12 out of 14 studies in our study showed significantly lower levels of serum vitamin D in CSU patients than in the controls [14, 18, 20, 21, 23–25, 28, 29, 31, 33]. Only Wu et al. found significantly higher levels of vitamin D in the CSU patients than in the UK general population as a control group . However, that study compared CSU patients in Southampton General Hospital to the UK general population rather than healthy controls in Southampton; a variation of serum vitamin D levels in different regions of UK was reported . Lee et al. reported no statistical significance between the vitamin D levels in pediatric CSU patients and the controls, which was similar to a study by Tsai et al. . Nevertheless, it should be noted that our study provides additional information regarding associations between vitamin D and urticaria than those of the two studies. Data regarding (1) types of serum vitamin D (2) outcome of vitamin D supplementation after treating with different dosages, types and duration of vitamin D are also added in this study. Potential factors determining vitamin D status include oral vitamin D intake, sun exposure, latitude, season, Fitzpatrick skin type, time spent outdoors, sun exposure practices, body mass index (BMI), physical activity, alcohol intake, and genetic polymorphism . Higher serum vitamin D levels can be observed with prolonged sun exposure, increased time spent outdoors, the summer season, living in lower latitudes, increased physical activity, moderate alcohol intake, and rs7041 gene polymorphism . In contrast, lower serum vitamin D levels can be observed with darker skin, female gender, higher BMI, excessive alcohol intake, and rs4588 gene polymorphism . It has been reported that vitamin D deficiency and insufficiency is a pandemic problem. The prevalence of vitamin D deficiency and insufficiency has been estimated to be 30%-60% of children and adults worldwide. Areas that had high prevalence of vitamin D deficiency and insufficiency in the general population were Europe (92%), Middle East (90%), Asia (45–98%), and Canada (61%). The most common cause of vitamin D deficiency and insufficiency is an insufficient exposure to sun-light as diet with fortified vitamin D are few. For example, in Middle East, vitamin D deficiency is found to strongly correlate with well-covering clothes [38, 39]. Vitamin D has been shown to be linked to other skin diseases. Low serum 25(OH)D levels have been reported in severe atopic dermatitis , psoriasis , vitiligo , systemic sclerosis , severe alopecia areata , severe systemic lupus erythematosus (SLE) , and acne  and also associated with an increased risk of cutaneous bacterial infections in vitro . However, no studies in our review reported the cut-off serum vitamin D levels that might be associated with the development of CSU. As to vitamin D supplementation, both vitamins D2 and D3 are commonly. Current dietary reference intakes for vitamin D are 400 IU per day in infancy, 600 IU per day in the 1–70 year age group, and 800 IU per day for individuals aged over 70 . Vitamin D2 is reported to be less effective than vitamin D3 in raising total serum vitamin D levels, but less toxic than vitamin D3 when given in large amounts . The variations in the vitamin D supplementation regimens in the studies might have led to different outcomes. Six studies showed that a high dosage of vitamin D treatment resulted in a significant reduction in CSU activity. [19, 24–27, 31] The other study reported that vitamin D supplement 2000 IU/day and 60,000 IU/week decreased disease activity in most CSU patients . Among the various regimens, higher dosages of vitamin D (vitamin D3 of at least 28,000 IU/week for 4–12 weeks, or vitamin D2 of 140,000 IU/week for 6 weeks) were reported to be effective. Although the available studies were relatively scarce, CSU patients with low serum vitamin D levels at baseline tended to show an improvement after receiving high dose vitamin D supplementation. Vitamin D has high safety margin. The tolerable upper intake levels are now 4000–10,000 IU/d for adults and the elderly, and lower for infants and young children [48, 49]. According to our systematic review, even though there were not reported any adverse effect during vitamin D therapy, high dosage of vitamin D use should be concerned about safety. Measurement of serum vitamin D levels may be useful for safety monitoring and determining relationship to the treatment outcome, and it should be concerned about potential adverse effect at serum 25(OH)D levels greater than 50 ng/ml (125 nmol/liter) . Vitamin D supplementation was reported for other skin diseases. A meta-analysis by Kim et al. of 4 randomized, double-blind, placebo-controlled trials showed that the SCORAD index and EASI score of atopic dermatitis patients decreased significantly after vitamin D supplementation . Lim et al. compared the vitamin D levels of patients with and without acne in a case–control study combined with a randomized controlled trial . Improvements in inflammatory lesions were noted after vitamin D supplementation in 39 acne patients with 25(OH)D deficiency. Abou–Raya et al. randomized 267 patients with SLE to receive either vitamin D3 (2000 IU daily) or a placebo. At 12 months of treatment, there was a significant decrease in the pro-inflammatory cytokines levels (i.e., IL-1, IL-6, IL-18 and TNF-α), anti-dsDNA, C4, fibrinogen, von Willebrand factor, and disease activity scores of the treatment group compared to the placebo group . This systematic review has some limitations. First, there are small numbers of relevant studies. Second, few studies are RCTs; and variety in the individualized vitamin D supplementation regimens contribute to unsettle treatment results. Most studies showed that CSU patients had significantly lower serum vitamin D levels than the controls [14, 18, 20, 21, 23–25, 28, 29, 31–33]. However, this relationship does not prove causation. Data from a limited number of studies showed that the responders tended to be CSU patients with low serum vitamin D at baseline who received high-dose vitamin D supplementation regimens. For recalcitrant CSU patients with low serum vitamin D levels, a high dose of vitamin D supplements for 4–12 weeks may be used as an adjunctive treatment. Well-designed randomized placebo-controlled studies should be performed to determine the cut-off levels for vitamin D supplementation and treatment outcomes. SA performed literature search of electronic databases. KK and SA screened articles for eligibility based on the inclusion criterion and assessed the risk of bias. PT and SA reviewed and extracted information from the eligible full-text articles. KK, PT, and LC contributed to the analysis of the results and to the writing of the manuscript. All authors read and approved the final manuscript. The authors gratefully acknowledge Dr. Saowalak Hunnangkul, Ph.D. Biostatistician, for assistance with the statistical analyses. The study protocol was approved by Siriraj Institutional Review Board, protocol No. 586/2560(Exempt). This research did not receive any specific grants from funding agencies in the public, commercial, or not-for-profit sectors.